• strøm is the long term musical project and labor of Christian Müller. 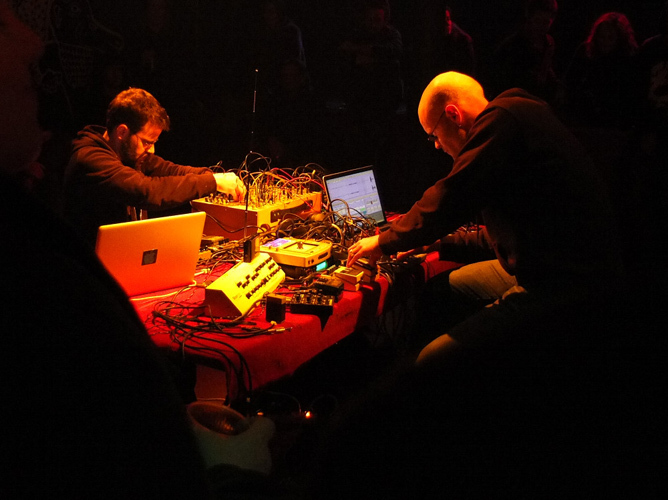 The electroacoustic, experimental duo with Gaudenz Badrutt is a hudge playground and working area over the last decade. The Siamese twins from Bienne improvise on various electronic devices, computer and and sometimes a bassclarinet in digital state space. Deformed by their classical formation they play the instruments not only in a common way. Their conjoined bodies are traversed and sparked by the alternating current of two minds; their music takes an unpredictable course, now flowing gently, glowing like lava, then interrupted by the occasional eruption, allowing the flow to change its course according to the spatial possibilities presented and breaking the flow down into sub-streams of sounds, allowing it to swell back to its original size. What a pity – here would be a soundplayer, if your browser would understand HTML5. Please use a newer browser therefor.